Convert YouTube to MOV, MP4, AVI, 3GP and vice versa easily. Download YouTube playlist to MOV easily by pasting URL. Burn YouTube videos in any format to DVD easily. If you are a lover of YouTube, you might often visit YouTube websites to watch wonderful online videos, or you've had a lot of YouTube videos stored on your PC or Mac. If you want to convert YouTube to QuickTime MOV, either an online YouTube video or a local-disk one for playback in QuickTime, manage it in iTunes even sync to Apple devices like iPhone, or other reasons, you will need a good YouTube to MOV converter to solve your problem. To help you convert YouTube to MOV, we discuss different solutions in the following part of the article including desktop converter for Windows/Mac and free YouTube to MOV converters online. Depending on your expectations and requirements, you can opt for the apt solution. To ensure that you can get high-quality MOV files from your YouTube videos, choosing the right tool is very important. 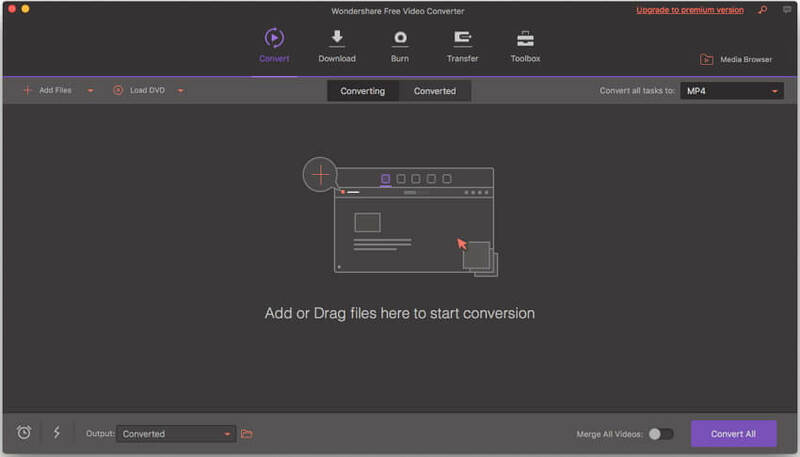 For all your downloading and conversion needs, we recommend Wondershare UniConverter (originally Wondershare Video Converter Ultimate). This excellent program enables to download videos from YouTube and other popular sites and convert them to MOV and other desired formats. With Windows as well as Mac supported, the software results in lossless quality files at super fast speed. 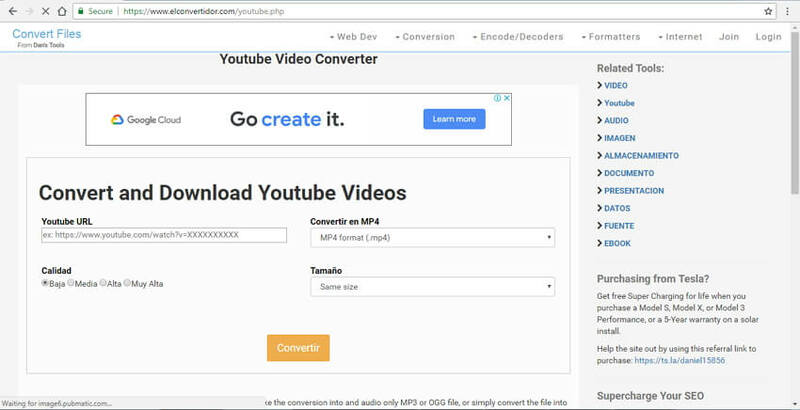 Convert YouTube to MOV and other 1000+ video and audio formats easily on Windows/Mac. Download YouTube playlist to MOV directly by pasting URL. Super fast (30 X faster) conversion speed with no quality loss. Edit videos by trimming, cropping, rotating, adding watermarks, editing subtitles, etc. Compress video size by changing video resolution, format, bitrate, encoder, and more parameters. Transfer converted files from PC/Mac to iPhone/iPad/Android devices via a USB cable. Using Wondershare UniConverter (originally Wondershare Video Converter Ultimate), You can either download online YouTube videos and convert them to MOV or can convert the local videos present on your PC to MOV. Both of the two solutions in details will be mentioned below. Just download and install it on your PC/Mac and follow details below. Step 1 Launch Wondershare YouTube to MOV converter and enable direct MOV conversion. 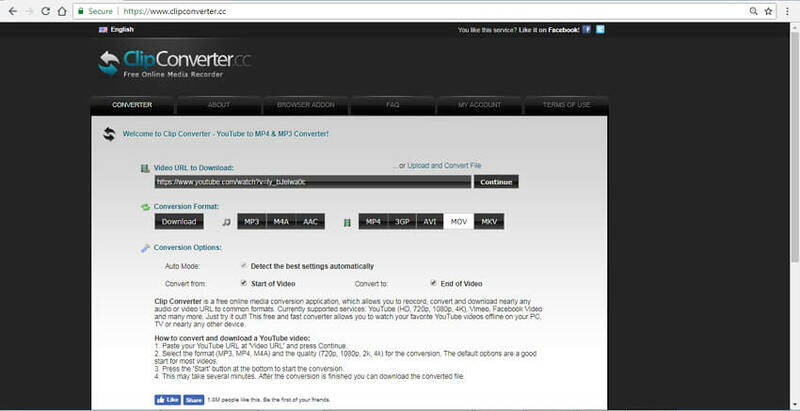 Download, install and open UniConverter (originally Wondershare Video Converter Ultimate) on your PC. Click on the Download tab from the main interface. On the top-right corner, move the toggle at Download then Convert Mode to the right side to enable it. From the drop-down window, choose MOV as the desired format from the Video tab. Also, choose the resolution of the output file. 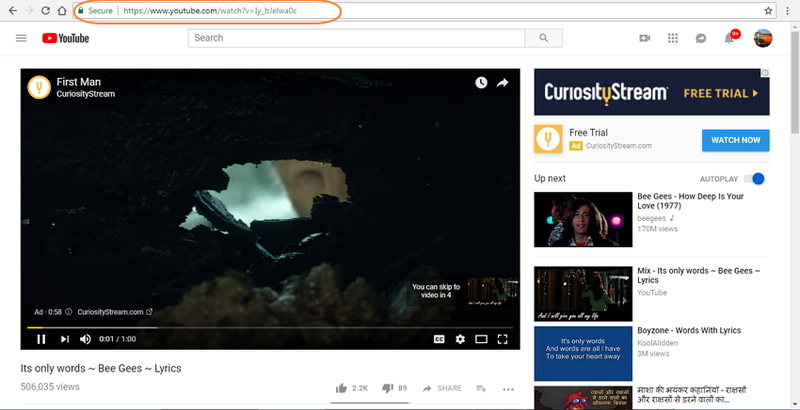 Step 2 Open YouTube video online and copy its URL. Next, on your PC browser, open the YouTube video that you want to download and convert. Copy the link of the video. Step 3 Convert YouTube to MOV. On the Download tab of the interface, click on + Paste URL that will automatically paste the copied URL and begin to analyze and download. After a while, you will find the downloaded and converted file will appear under the Finished tab. 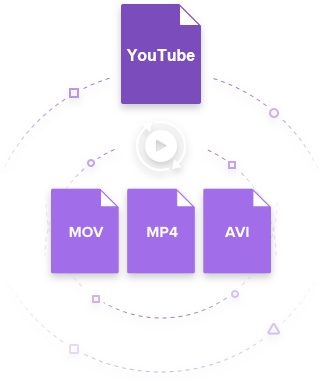 The videos will be downloaded in MP4 format automatically, if you want to convert to MOV, just right-click and select Add to Convert List option to change to MOV format with steps in Situation 2. Using the software, you can also convert the yet downloaded YouTube videos on your computer to MOV format. Step 1 Open Wondershare YouTube to .mov converter and load YouTube videos. Launch UniConverter (originally Wondershare Video Converter Ultimate) on your PC. From the Convert tab, click +Add Files to browse and add YouTube videos from your PC. Or you can drag and drop the files. Multiple files can be added here. Step 2 Choose MOV as target format. On the top-right corner, open drop down menu at Convert all files to: and choose MOV from the Video tab. Also, select the desired resolution. Step 3 Convert YouTube video to MOV. At the Converting tab, choose PC location where you want to save the converted files at the middle bottom. Finally, click Convert All to start YouTube to MOV conversion process. For a few and basic YouTube MOV conversion, online programs prove to be a decent choice. Majority of the online tools are free to use and they work directly from your PC browser. Thus, while working with online YouTube to MOV converters, there are no hassles of software download, installation, and registration. 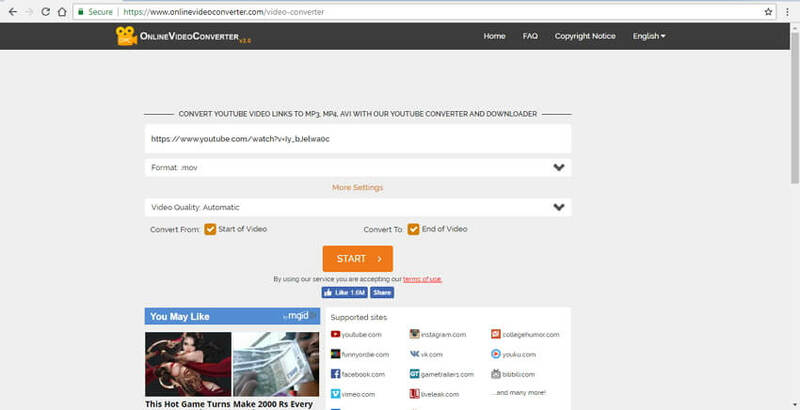 Listed below are the top free to use online YouTube to .mov converter. This is one of the best online tools for all your conversions need. The program has a simple interface and allows adding a YouTube link for download, and conversion purpose. In addition to MOV, the video can be downloaded in other popular audio and video formats. The site also supports video download from other popular sites like Vimeo, Instagram, DailyMotion, Break, and others. The program is compatible with all latest browsers and results in decent quality files. There is no restriction to the number of videos that can be downloaded or converted. Online Video Converter also allows choosing the quality of the video and can also trim and crop the video if needed. Step 1: Open https://www.onlinevideoconverter.com/video-converter on your PC browser. Step 2: Copy YouTube URL that you want to download, and paste its link at the program interface. Choose MOV as the target format from the Video list. Step 3: Click More Settings for choosing quality and video part for the conversion. Finally, click START to begin YouTube to MOV download and conversion process. This is another name in the list of popular and free to use online video conversion tool. Using the program you can download and convert YouTube videos to MOV, MKV, AVI, MP4, and 3GP format. Video to audio conversion is also supported. In addition to YouTube, online sites like Vimeo, Facebook, and others are also supported for video download. You can also choose the quality of the output file and add local files for conversion as well. There is also an option to convert only a part of the video to your desired format. Step 1: Launch https://www.clipconverter.cc/ on your browser. Copy YouTube URL that you want to download and convert. Paste the URL at the interface. 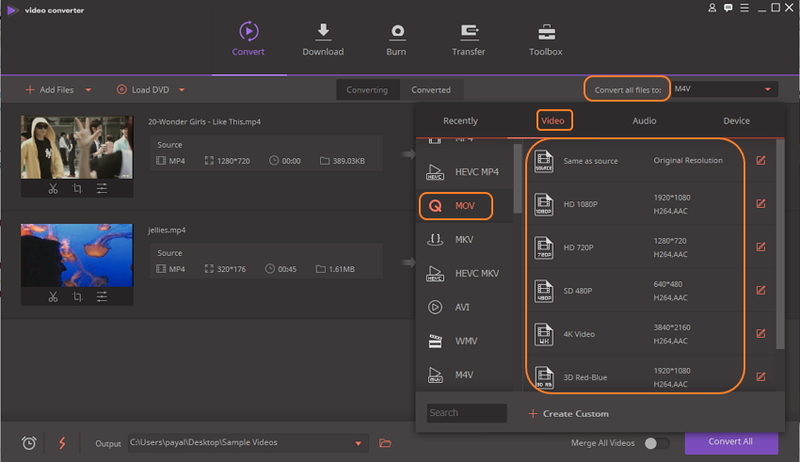 Step 2: Under Conversion Format, choose MOV from the list of supported video formats. Under Conversion Options, choose start and end of the video if needed. Step 3: Click Continue to start YouTube to MOV conversion process. Upon completion, the converted file can be downloaded from the program interface. Using this decent online program, you can convert all your YouTube videos to MOV format in quick and simple steps. A number of video and audio files are supported for conversion. The program gives you the option to choose the quality as well as the file size in terms of resolution for the MOV video. The program needs no download or installation and has a simple interface. Step 1: Open https://www.elconvertidor.com/youtube.php on the browser of your PC. Copy YouTube URL that needs to be converted. Paste the URL at the program interface. 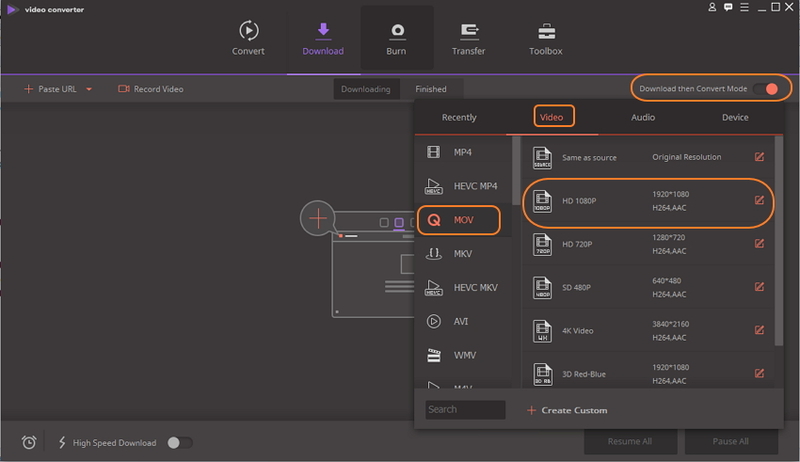 Step 2: Choose MOV as the output format from the list of supported videos. Also, choose the quality and size of the output file. Step 3: Click Convert to start YouTube download and conversion process. Another solution to download YouTube MOV is to use YouTube to MOV freeware and here we recommend Wondershare Free Video Converter for Mac. 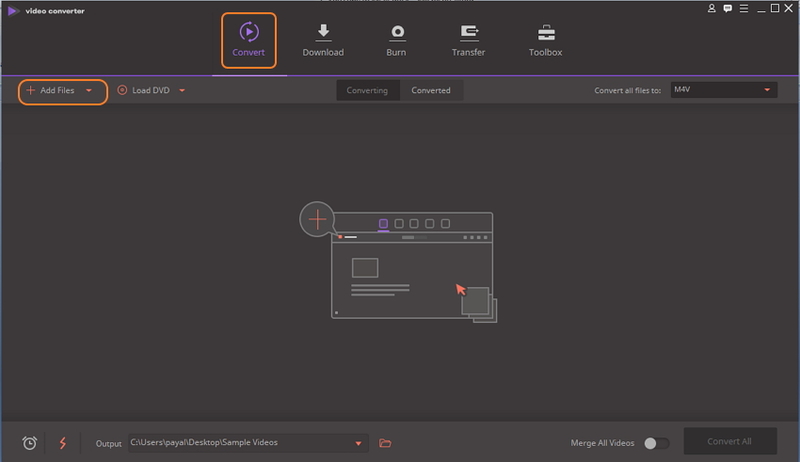 This free-to-use program is the free version of Wondershare UniConverter (originally Wondershare Video Converter Ultimate) which also allows downloading YouTube videos and convert to MOV format. Like most freeware you can find, Wondershare Free Video Converter would give a watermark to the downloaded videos. If you don't mind this, just follow the simple steps below to convert and download YouTube videos to MOV free. YouTube video downloads in a few simple steps. 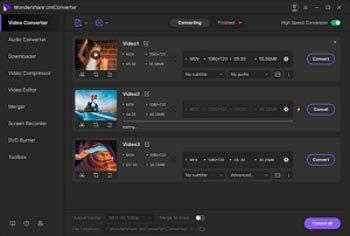 Allows editing videos with features like crop, trim, and others before conversion. Supports working on Mac OS X 10.6 -10.14 versions. Step 1: Launch Wondershare Free Video Converter on Mac. Download, install and open Wondershare software on your Mac. Click and choose the Download tab from the main interface. Step 2: Select and download desired YouTube video. Click the Paste URL button to paste the YouTube URL you've copied, the download process will be started after clicking the Download button. Step 3: Convert YouTube downloaded video to MOV. Once the video is downloaded and saved, move to the Finished tab and right-click to select Add to Convert List button to convert to MOV format. In the above part of the article, we have listed 3 solutions – desktop software, online converters, and freeware to download and convert your YouTube videos to MOV format. Each of these methods have their associated pros and cons. The comparison table below will help you to choose the best method as per your requirements. Yes, supports downloading playlists and a number of files at a time. A complete video editor with features like trim, crop, adding special effects, and others. Basic editing features like selecting quality and size of the video.